Comilla (Bengali: কুমিল্লা) is a metropolitan city in eastern Bangladesh, located along the Dhaka-Chittagong Highway. It is the administrative centre of the Comilla District, part of the Chittagong Division. 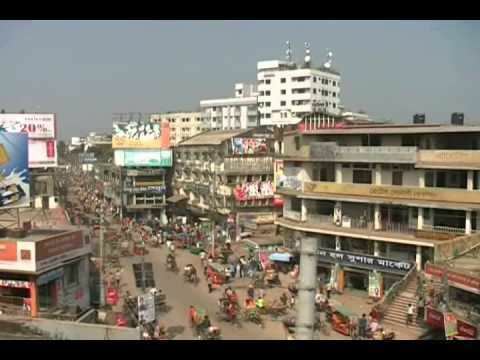 Comilla is the second-largest city of eastern Bangladesh after Chittagong and is one of the three oldest cities in Bangladesh. 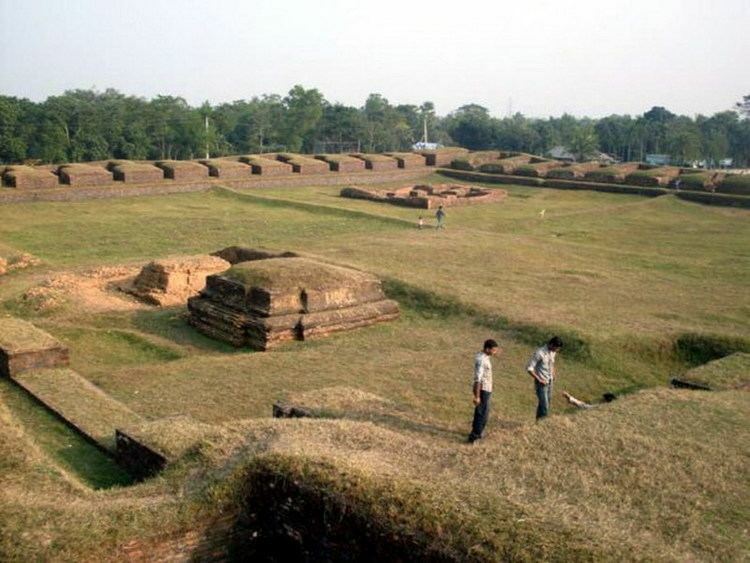 The Comilla region was once under ancient Samatata and was joined with Tripura State. This district came under the reign of the kings of the Harikela in the ninth century AD. Lalmai Mainamati was ruled by Deva dynasty (eighth century AD), and (during 10th and mid-11th century AD). In 1732, it became the centre of the Bengal-backed domain of Jagat Manikya. The Peasants Movement against the king of Tripura in 1764, which originally formed under the leadership of Shamsher Gazi is a notable historical event in Comilla. It came under the rule of East India Company in 1765. This district was established as Tripura district in 1790. It was renamed Comilla in 1960. Chandpur and Brahmanbaria subdivisions of this district were transformed into districts in 1984. Communal tension spread over Comilla when a Muslim was shot in the town during the partition of Bengal in 1905. On 21 November 1921, Kazi Nazrul Islam composed patriotic songs and tried to awaken the town people by protesting the Prince of Wales's visit to India. During this time, Avay Ashram, as a revolutionary institution, played a significant role. Poet Rabindranath Tagore and Mahatma Gandhi visited Comilla at that time. In 1931, approximately 4000 peasants in Mohini village in Chauddagram Upazila revolted against a land revenue tax. The British Gurkha soldiers fired indiscriminately on the crowd, killing four people. In a major peasant gathering, the police fired at Hasnabad of Laksam Upazila in 1932. Two people were killed and many were wounded. Comilla Victoria Government College in the city was named in memory of Queen Victoria . Comilla Cantonment is one of the most important military bases and is the oldest in East Bengal. It was widely used by the British Indian Army during World War II. It was the headquarters of the British 14th Army.There is a war cemetery, Maynamati War Cemetery, in Comilla that was established after the World War II to remember the Allied soldiers who died during World War I and II, mostly from Commonwealth states and the United States. There are a number of Japanese soldiers were buried there as well, from the second world war. People of Comilla served as language fighter in 1952. Students of Comilla Victoria College protested against Pakistan Government. Shaheed Dhirendranath Datta was one of important leaders of the language movement who was from comilla. Shib Narayan Das was one of designer of the first flag of Bangladesh. He was part of BLF. Comilla was part of sector 2 during the Liberation war of Bangladesh. Jehangir Khan Tareen was a Pakistani politician of Pakistan Tehreek-e-Insaf. He was also born in Comilla. Comilla covers a total area of 51 square kilometres. It is bounded by Burchiganj and Tripura on the north, Laksham and Chauddagram on the south, and Barura on the west. The major rivers that pass through Comilla include Gumti and Little Feni. The Tropic of Cancer crosses Comilla town on the south side just over the Thomson Bridge. Comilla has a number of tourist attractions. Various archaeological relics discovered in the district, especially from the 7th–8th century, are now preserved in the Mainamati Museum. There is a World War II war cemetery in Comilla, which is protected and maintained by the Commonwealth War Graves Commission. Comilla Victorians is a professional cricket team based in Comilla and is the second most successful club in the Bangladesh Premier League. Comilla Victorians also has the most wins in the league. Comilla is one of the major cities for politics in country. Bangladesh Nationalist Party and Bangladesh Awami League is popular throughout the city. Comilla runs for City Corporation elections also. City Corporation Comilla City Corporation is a self-governed municipal administration in Bangladesh that administers and oversees development and maintenance works in the city. The corporation covers an area of over 33 square kilometre in the Comilla district where over five million people live as permanent residents. 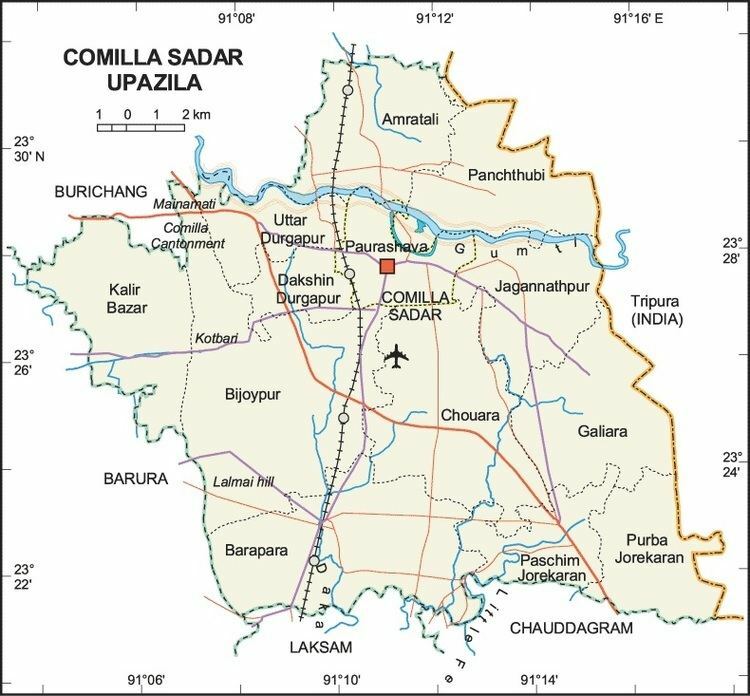 The body was known as Comilla Municipality previously, until it obtained the City Corporation status by a ministry of local government declaration on 10 July 2011. The Comilla City Corporation is responsible for administering and providing basic infrastructure to the city. Building and maintenance of roads and streets. Comilla Cantonment is a cantonment located nearby the city. The personnel of Bangladesh Army with local civilian inhabit here.The 33rd Infantry Division HQ is also located here. Bangladesh Military Academy was initially established at Comilla Cantonment on 11 January 1974 and later relocated at Bhatiary in 1976. Comilla Cantonment provides Comilla Cadet College, Comilla Ispahani Public School and College, Comilla Cantonment College, Comilla Cantonment High School. Comilla is controlled by the Comilla City Corporation. It has total 27 wards. Those are neighbourhoods of Comilla city. Comilla is a hub of road communication of eastern part of Bangladesh. One of the oldest highways of the Indian Sub-continent, 'The Grand Trunk Road' passes through the city. The most important Dhaka–Chittagong Highway bypasses the city from the cantonment to Poduar Bazar. 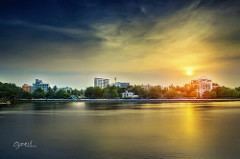 Comilla is located 97 kilometres from the capital city, Dhaka, which can be reached by road or railway. Electric trike in recent years began to overwhelm Comilla streets, mostly because of its convenience in short distance commutation throughout the main town. Comilla is a nearby city of Laksham Junction and Akhaura Railway Junction (largest in the country). Rail conncetion is available to Dhaka, Chittagong, Brahmanbaria and Sylhet. Comilla's only airport is currently closed since the city is nearby other major cities. Comilla Airport was announced to open again in 2012. Its runway is 26 ft long. The Board of Secondary and Higher Secondary Education is responsible for holding public examinations (JSC, S.S.C and H.S.C) in Comilla and five nearby districts. Comilla produced people who built the country. Shib Narayan Das was member of BLF. He was one of the designers of the first flag of Bangladesh. Shaheed Dhirendranath Datta was ex-Minister of Law, Language movement activist and Shaheed of 1971. Many people like him fought for the country. Lt-Col. Akbar Hussain veteran freedom fighter. He was Minister of Mineral Sources in 1978. He was also Minister of Forest Preservation in 1991. Later he was Minister of Inland Water. Major Abdul Gani was born in Nagais village under Brahmmanpara upazilla of Comilla district on 1 December 1915. He, an officer of the armed forces division was the organiser of the First East Bengal Regiment. Khondaker Mostaq Ahmad was a President of Bangladesh; he also served as Minister and member of Exile Cabinet of Meherpur Government. Kazi Zafar Ahmed, was Prime Minister in 1988. He was also Minister of Education in 1986. Khandaker Mosharraf Hossain was Minister of Energy & Mineral Resources in 1991 and Minister of Health & Family Welfare in 2001. Mustafa Kamal served as president in International Cricket Council. Shaukat Mahmood was senior journalist and editor of Weekly Economic Times. He was elected president of National Press Club. Buddhadeb Bosu was a Bangla poet, novelist, translator, editor and essayist. Kazi Nazrul Islam was born in West Bengal, but resided at Comilla for long. He loved this place. Another poet wasAbdul Kadir. Was also a researcher and editor. Lots of re-known high officials such secretary. Among them A K M Abdul Awal Mazumder is very honest, devoted to his works.